It was a second round in Mondays club, my opponent was a 1447 rated young man. I got Black and we played Queen’s Pawn game. Computer agrees with my 13… Nbd7, but criticizes 14… Bxc3 (which I didn’t like myself) suggesting 14… Qb6 and if 15. a3 then 15… Rfe8 16. Bd2 Bxc3 17. Qxc3 Nxe4. He went for a double rooks exchange, computer prefers 19. Ne5. I was glad to find 22. Nc8, it defended against all threats, also it contained a trap. After b6 his bishop was getting caught. He didn’t see it and played 23. Nd3. After 25. Nf4 I thought about moving the bishop, but then decided to play simple. He resigned right after my move. I played in the Rapid Team tournament on Monday. The tournament didn’t go too well with 2/5, but the last round game was interesting. We castled opposite sides, he attacked on the kingside, me on the queenside. 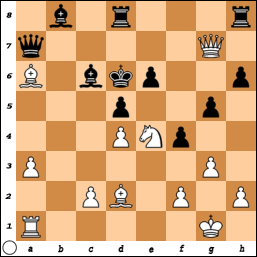 After I opened the “b” vertical, I sacrificed the rook for the knight on b8 and pawn on a6. After a few moves we came to the position on the diagram. I played 1. Ne5 Nxe5 2. Qxe5+ Ke7 3. Qg7+ Kd6. Then I saw the knight sacrifice on e4. So I played 4. Ne4+ dxe4 5. 5. Bb4+ Kd5, then I made a planned move Qe5+. Suddenly he takes my queen with the bishop. I was in a shock, then played 7. c4+ Kxd4 and suddenly I saw a mate on d1. It was a 3rd round in Thursdays club, I almost didn’t go as I had a cough since Monday. But it got better and I didn’t want to miss the game. My opponent was an old man rated 1479, I drew him recently. He played the same Four Nights Defense, a quiet line, as the last time. He definitely wanted a draw and went for exchanges. His exchange combination 24. 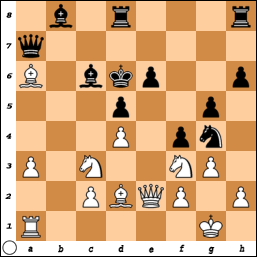 Nh4 was actually a mistake, he was getting a piece back of course, but after 27… Qa5 28. Kg1 f6 29. b4 Qxa2 was losing a pawn. After queens exchange I was feeling that I still have some advantage and tried to use it. After 56 moves the position was still equal. I thought that he made a blunder on move 58, but his 57. bxc5 was already a crucial mistake, instead 57. b5 was keeping it equal. After I won the pawn it became technical. It was a last round, I was playing against the leader having 4/4 (despite of his 1442 rating). I expected him, looked at the game that I won with Back against him, but unexpectedly got White. He played French, I chose Tarrasch closed as usual and after 11 moves was on my own, as Bf4 that I remembered didn’t look alright because of Qxb2. I wanted to prevent e5, but didn’t see how and only after I played 15. Qd2 I saw that I had to provoke, not prevent e5. If let’s say 15. h3 e5 then 16. Rxc6 bxc6 17. dxe5 and I win 2 pieces for a rook. But it was already late, as now it didn’t work. I was feeling under pressure until 23. h3, but then realized that I am OK and his position has some weaknesses including king cover. His 23… h5 just strengthened that point of view. I saw that I can play Nxh5 with the following queen check, but then I thought that Rf7 prevents it, not seeing the check on e8. Then I saw 27. 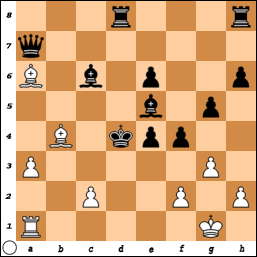 Nxg7, but again thought that it is not possible because of 27… Ne4, but White just plays 28. Nxe6 and stays the pawn up. Instead of 31. Nd4 I could play 31. Qh4 Kg8 32. g5 and Black can’t move the knight because of g6 threat. 31… g6 was a game losing mistake.